For quite some time I have been eating what some might refer to as a gourmet raw diet. This was sustainable for a while but it was becoming increasingly expensive, time consuming, and the recipes were high in fat. Yes, it is possible eat too much fat or for that matter, gain weight on a raw foods diet. Usually this equates to a large consumption of nuts, seeds, and avocado. I've learned that I have traveled the path of many before me in that I eventually came to find that I needed to go simpler. I redirected my focus to eating more salads and less complex recipes. Somewhere along the way I found the book, entitled, The 80/10/10 Diet: Balancing Your Health, Your Weight, and Your Life One Luscious Bite at a Time by Dr. Douglas Graham. I read the book and furthered my research by reading articles, blogs, forums, and by watching countless Youtube videos that featured lead figures in the living foods movement, including Dr. Graham. Lead figures or anyone who likes to see themselves online and spout off about the wonders or their distaste for this diet. I did this for about a year and I have finally decided to go for it. So, what is this brand of raw? 80% of my calories will come from fruit. Yes, fruit. It's alright. Settle down. Breathe. 10% will come from vegetables and the remaining 10 will come from fat. Lady J, where will you get your protein? An all too common, at times fatiguing, but certainly important question. Guess what kids, plants have protein. Protein from meat is dead protein and despite what the meat and dairy companies would have us believe, we do not need more that 10%. Heat kills the enzymes in food and this means that not only does meat provide incomplete protein due to it's cooked and fatty state but the protein is accompanied by toxins that are ushered through us by way of destroyed nutrients. Believe me when I say that we can get all the protein and nutrients we need from fruits and vegetables. Meat is very acidic and it is damaging whereas acidity from certain citrus foods, are not. If you don't already have some, it might be a good idea to purchase some Ph balance strips. You simply put the strip in your mouth and moisten it with your tongue and you will observe a change in color to the strip. You will see where you land on an alkaline scale. Your are what you eat. I am what I eat. What happens inside our gut affects everything else internally and on the surface. For example. If you look tired when you're not, if you have wrinkles, blemishes, acne, psoriasis, any sign of premature aging; you've got work to do. What understandably seems so absurd, coo-coo crazy, what the hell-about this is the sheer volume of food one must consume in order to maintain this way of living. Fruits and vegetables are low in calorie but very high in water content. An average meal will not be so easy to scarf down in the initial stages. I plan to mono-meal quite a bit and what this means is that I will be eating a meal of just one fruit. Meal plans on this diet often start off with a liter of water in the morning due to the fact that we need to hydrate after a full night without water. Then a smoothie or juice as large as a liter. A liter translates to 33 oz. A mono-meal lunch of nectarines for instance, could consist of 10 or 12. Lastly, dinner would be a huge salad with 2lbs of leafy greens. 2lbs equates to two heads of greens. The more active a person is, the more one needs to consume. I am an active girl, so I will likely reach between 2000 to 2500 calories. Know that 2500 calories of whole foods is much different than eating 2500 of meat, bread, ice cream and other SAD (stardard american diet) foods. Let me break down the rationale for the dietary ratios. Know that fruit is made up of simple sugars, and simple sugars are simple carbohydrates. Energy. Fruit - sweet fruits in particular are the easiest food that your body can digest. Everything we eat is broken down into sugar (glucose). Fats, complex carbs, and high protein meals (put the protein powder down!) takes much more energy and exertion to digest and produces toxins in the process. Fruit is a means for easy assimilation which relives the body of such strain. No wonder so many raw foodists rave about their high energy, mental clarity, improved mood, and overall well-being. I am also looking forward to having better bowel movements. Yep. C'mon people. You may not think constipation is a big deal or that you yourself may be constipated, but in my opinion, colon health is something we ALL need to be paying attention to. Soon I will be devoting a post to the ol' mighty colon, but for now let me ask you this. Are you having 3 to 4 bowel movements a day? If not, guess what? You're backed up. And when I say backed up, I mean that there is more old wadte inside you than you can imagine and it is preventing you from thriving. I know a major concern about a fruit heavy diet is that blood sugar will spike. Fruit will raise my blood sugar but it will quickly fall again as fruit digests quickly. Any food affects blood sugar. If I were to be eating large quantities of fruit as well as artificial and processed sugars, I'd be in trouble. If I were to combine the two, the sugars inside me would ferment. By the way; proper food combining between fruits and vegetables is an area I will address in a future post. For those of you with varying types of insulin resistance such as Type l or ll Diabetes or Polycystic Ovarian Syndrome, you needn't fret if you decide to pursue 80/10/10. This diet will only help. Do your own research and you will see that many are able to reverse these issues with raw foods. It’s not too good to be true. Disease cannot exist in an alkaline state. We can ward off or reverse illness. 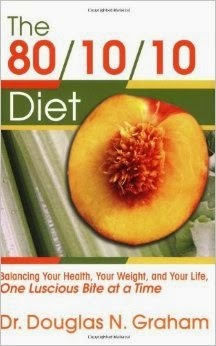 Cancer, heart disease, hyperglycemia, hypo and hyper-thyroidism, etc. As I age I have become more and more concerned with brain health. I'm looking forward to improved memory function, and preventing alzheimer's sounds a-okay to me. I want to be as spry, agile, limber, attentive, and happy as my potential will allow and I'd like to keep rocking it for a long-ong time. Know that the 80/10/10 numbers are a guideline and what you eat needn't be exact each day. I understand that this is a journey and it will take time to figure out how I can manage and sustain it. If this topic strikes your fancy, hang around. There will be more 80/10/10 posts in the future.